As a young priest, David Zubik was personal secretary to the tenth bishop of Pittsburgh. After a decade in the official ranks, the eleventh bishop tapped him as vicar-general, ordaining him to the episcopacy and seeing him off to a diocese of his own. And now, a decade later, the native son is heading home as the twelfth bishop. This morning, Pope Benedict appointed Zubik, 57, to the Steel City after a charged 14-month vacancy created by the promotion of his mentor, Donald Wuerl, to the archdiocese of Washington in May 2006. The fulfillment of his now-predecessor's much-desired -- and much-advocated -- outcome, Zubik's return to his hometown's top ecclesiastical post indicates Rome's firm placet in the administration whose day-to-day operations he ran for seven years before heading to Green Bay in 2003, besides further evidencing the kingmaking clout the DC prelate, a Vatican veteran, wields in its halls. Born in the working-class steel town of Ambridge, near Sewickley, Zubik attended Pittsburgh's St Paul (College) Seminary and Duquesne University before heading to Baltimore's St Mary's Seminary, from which he was ordained in 1975. After serving in parishes, Catholic education and picking up a Master's in Educational Administration from Duquesne, he became administrative secretary to then-Bishop Anthony Bevilacqua in 1987, continuing in the post when then-Bishop Donald Wuerl arrived the following year. 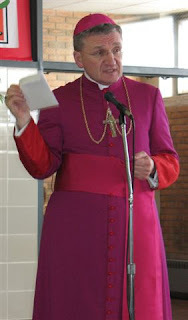 In 1991, the eleventh bishop gave his eventual successor the Clergy Personnel brief; five years later, after a brief period as chancellor, he became vicar-general and General Secretary, rising to the top administrative post of the diocese of 820,000. Described as a "workhorse" in Wuerl's scrupulously organized, detail-rich mould, Pope John Paul II appointed Zubik auxiliary bishop in 1997; until his episcopal elevation, he served as a spiritual director at St Vincent's Seminary in Latrobe alongside his diocesan duties. In 2003, the late pontiff promoted him to Green Bay to succeed the retiring Bishop Robert Banks. In the Wisconsin diocese, Zubik honed in characteristic style on its pressing challenges, working particularly toward ensuring a sound future in the areas of Catholic education and priestly vocations. As with other prelates nationwide who've been successful in recruiting more men for formation, the bishop's intense personal investment in the latter has resulted in an increase of seminary candidates for Green Bay's flock of 350,000. The vocation question is particularly crucial to Pittsburgh's outlook -- a declining number of priests has resulted in pastors now being split between multiple parishes, and a religious sister was installed as the diocese's first "parish life collaborator" last weekend. Of the eight names floated for the vacant bishopric by the Pittsburgh Post-Gazette a year ago this week, four (including Zubik) have since gone on to new assignments. While strong pushes by influential parties were made to advance others among the listed for the Western Pennsylvania post, then-Bishop John Niendstedt was instead sent to the archdiocese of St Paul and Minneapolis and then-Bishop Joseph Kurtz to the archdiocese of Louisville. In an indicator of the maneuvering of the process over the months leading to this morning's appointment, what the casual observer could've viewed as unrelated moves on the national chessboard were not insignificant contributions toward clearing Zubik's path back home. The appointment also adds further burnish to the longstanding reports that, especially in cases of prominent posts, Benedict XVI is significantly more inclined to give near-decisive weight to the leanings of the office's prior occupant. On the recent release of Pope Benedict's motu proprio on the pre-Conciliar celebration of the liturgy, Zubik told his Green Bay fold that while he "wish[ed] to state emphatically that the Mass is not changing," adherents of the newly-termed "extraordinary" use of the Roman rite "have been given and have found a place to worship suitably in our own diocese," specifically through the ministry there of the 1962-exclusive Institute of Christ the King, Sovereign Priest. Earlier this year, Zubik administered Confirmation to the group's parishioners according to the pontifical of Bl John XXIII. According to the provisions of Canon Law, Zubik's installation as bishop of Pittsburgh must take place within two months of this morning's appointment. Along these lines, a late September installation date has already been foreseen. Founded in 1843, when it encompassed the western half of Pennsylvania, the diocese of Pittsburgh's recent history has proven it a training-ground for senior leadership in the church both in the States and beyond. Since 1950, when then-Bishop John Dearden became its eighth ordinary, four of St Paul's Cathedral's five occupants have gone on to receive the cardinal's red hat -- or, in the case of Wuerl, are primed to maintain the precedent within a short space of time. Also uniquely, since the 1969 appointment of Bishop Vincent Leonard (the last ordinary to not leave the post by promotion), Zubik's appointment makes three of four Pittsburgh ordinaries who have been native sons of the diocese. Elsewhere on the map, another Pittsburgh priest who, like Zubik, went on to become bishop of Green Bay currently has a red hat of his own. Others may be expecting his successor quickly, but word from those close to Cardinal Adam Maida of Detroit says "enjoy your summer -- and don't hold your breath." Then again, these days -- as the rapidly-collapsed timetable on today's appointment proves -- anything is possible... and at any time. SVILUPPO: Homecoming/installation date announced for 28 September in St Paul's Cathedral; press conference confirmed for 10am at Chancery, noon Mass at adjoining St Mary of Mercy church. Zubik: “I was truly honored to serve the wonderful people of Green Bay. Green Bay became my new home. Now Pittsburgh is my home again. I love the Church of Pittsburgh. I love being a part of the presbyterate of Pittsburgh once again. I love the people of Pittsburgh. It is a wonderful church – very much alive in Christ." Wuerl: "Personally, I rejoice with the news of this appointment. I am very pleased for what it will mean to the Diocese of Pittsburgh. Bishop Zubik knows, loves and has served the Church of Pittsburgh, and has walked with it through all of its many moments of challenge and development for the past 20 years. My prayer is that God will bless him and his ministry and of course the Church of Pittsburgh." Constant updates on the P-G's morning piece.